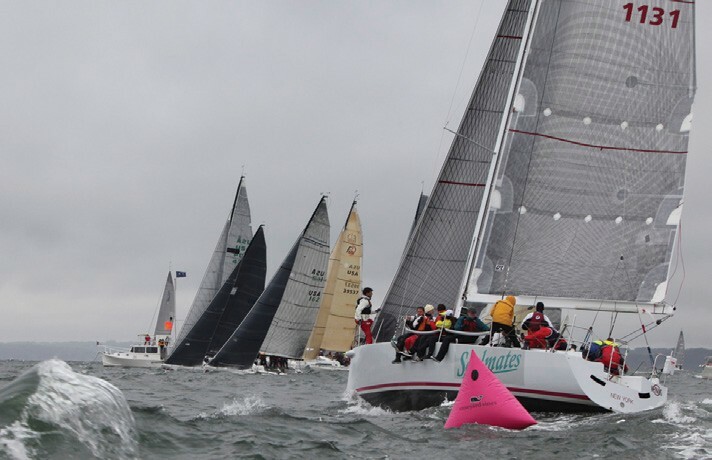 On Columbus Day weekend, more than 430 college sailors raced 52 owner-coached keelboats on Western Long Island Sound in the Storm Trysail Foundation’s Intercollegiate Offshore Regatta (IOR). 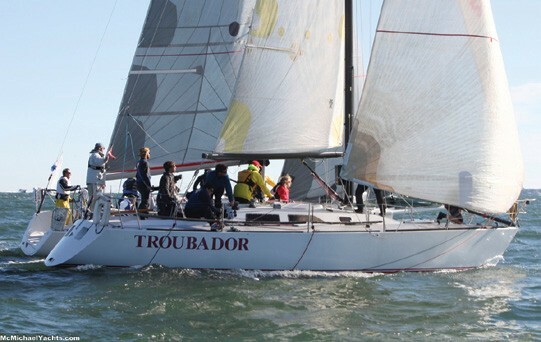 The team from the University of Toledo, sailing the Express 37 Troubador, was the overall winner after winning three races and finishing second in two races in the 10-boat PHRF class. a Farr 30, two C&C 115s, a J/88 and a Tripp 37. The second day brought a dying northerly breeze, and the race committee led by Storm Trysail Club Principal Race Officer Charles “Butch” Ulmer skillfully got in two races – both of them “bonuses” considering the forecast. The Intercollegiate Offshore Regatta is organized by the Storm Trysail Foundation (STF) and Larchmont Yacht Club in Larchmont, NY, and this year was led by Regatta Chairman Barry Gold. The goal of the event is to introduce dinghy sailors to the fun and teamwork of big boat racing, a new aspect of the sport to many dinghy sailors. It also gives college sailors with big boat skills a chance to compete in some of the best-prepared boats around. The 52-boat fleet was divided up into five classes: Twelve 32- to 43-foot IRC boats, five J/44s, 13 J/109s, 10 PHRF boats and 12 J/105s. A team from the U.S. 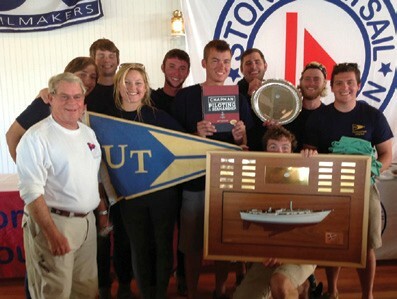 Naval Academy, sailing the J/133 Antidote, won the IRC class. After six races, their score line read 1, 1, 1, 2, 1, 4. Finishing second was Ohio State sailing the Sydney 43 Christopher Dragon, while third place went to Michigan Technological University sailing the Swan 42 Quintessence. The J/109 class had the most international entries, which included three of the four Canadian teams and two teams from France. Finishing third in the J/109 class was the team from Arts et Métiers from Paris. As the winners of the 46th EDHEC Sailing Cup, raced last April in Les Sables-d’Olonne France, their team won an all expense paid trip (except for airfare) to the IOR thanks to the joint venture between the STF and the EDHEC Sailing Cup. The EDHEC Sailing Cup is the world’s biggest college sailing regatta that draws over 1,500 sailors and 180 boats, and the joint venture with the STF is designed to bring the top college sailors in the world together. As a result of being the overall winner of the IOR, the team from the University of Toledo has won an all expenses paid (except for airfare) to the 47th EDHEC Sailing Cup in La Rochelle, France in April, 2015. All U.S. collegiate teams are welcome. When talking about the invite to the EDHEC regatta, one of the Toledo sailors said, “I guess I’ll have to get my first passport.” Now that’s what you call an education. Thanks to sponsors Rolex, vineyard vines, Caithness Energy, Safe Flight Instruments, Pantaenius Yacht Insurance, Flintlock Construction, Dimension/Polyant Sailcloth, UK Sailmakers, Gill, Lewmar, Heineken, Coke and YachtScoring, there is no entry fee for the IOR, and meals are provided for the boat owners and college sailors. The Storm Trysail Foundation is a 501(c)3 charitable organization dedicated to support the education of sailors, junior safety at sea, and intercollegiate big boat racing. The Storm Trysail Foundation educates young sailors as they bridge the gap between learning to sail and becoming accomplished blue water seamen, through a national program of events including junior safety at sea seminars and intercollegiate big boat racing. For more information, pictures and complete results, visit stormtrysailfoundation.org/intercollegiate.htm, contact info@stormtrysailfoundation.org, or visit the Storm Trysail Foundation’s Facebook page.